Lock in a great price for Angel Inn – rated 9.2 by recent guests! Gorgeous old inn with atmosphere of the 1600s but with of course all modern amenities. Superior food, creative menu, super breakfast. I loved the eggs Benedict! Picturesque village in a very pretty part of England. Excellent breakfasts with good range of food available. This hotel has real character with a magnificent dining area. Bedrooms, too, were interesting and comfortable. Some low beams. Well greased operation; great team, food and facility you will not be disappointed! Staff very friendly and helpful. Location is great. Excellent breakfast. Lovely old place over 600 years old, bags of character and some of the most charming staff we've encountered anywhere. Quirky bedroom with antique furniture, comfy bed and wow! the bathroom! Huge room with an armchair and a long, deep bath with lashings of hot water so you can have a luxurious soak - heaven! Great dinner and an excellent breakfast. Loved it all. Liked everything except for item mentioned in the answer below. Fantastic customer service from Becky and her team. Nothing was too much trouble, attentive but not intrusive. The staff had placed Rose petals in our room as it was our anniversary which was a nice touch. They were attentive and the food was first rate. Angel Inn This rating is a reflection of how the property compares to the industry standard when it comes to price, facilities and services available. It's based on a self-evaluation by the property. Use this rating to help choose your stay! Set in beautiful Suffolk countryside, this grade II 16th-century coaching Inn’s offers rooms with antique furniture and free Wi-Fi. The traditional restaurant and bar provide great food and real ales. With a flat-screen TV, free tea and coffee and a hairdryer, each individually styled room also features elegant décor. Some rooms have original exposed beams, while all have a private bathroom. As an extra special touch, champagne, flowers or luxury chocolates can be added as a supplement. Angel Inn provides a range of breakfast options, including full English breakfasts. Served in the dining room or in the courtyard, the seasonal lunch and a dinner menus are made with local produce. The Inn’s charming bar has beamed ceilings, and stocks beers from small regional breweries. It also provides a range of carefully selected fine wines. 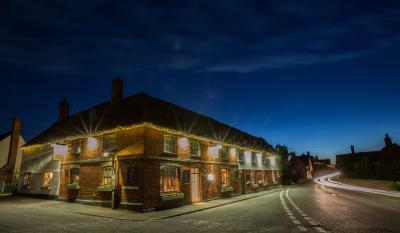 In the tranquil village of Stoke-by-Nayland, the Angel is set on a ridge overlooking the Stor Valley. The village church’s grand tower appears in many of John Constable’s paintings. When would you like to stay at Angel Inn? Individually styled rooms, some with original oak beams and either a private bath or shower room. All are furnished with antique furniture and comfortable beds. Please request twin or double using the Comment Box when booking. With a private bathroom, fitted wardrobe and table and chairs. These individually decorated rooms feature original oak beams and either a private bathroom or shower room. All rooms have antique furniture and comfortable beds. Please request a twin or double room by using the Comments Box when booking. This twin/double room features an electric kettle and private entrance. This double room features a private entrance and electric kettle. House Rules Angel Inn takes special requests – add in the next step! Debit card Angel Inn accepts these cards and reserves the right to temporarily hold an amount prior to arrival. Angel Inn accepts these cards and reserves the right to temporarily hold an amount prior to arrival. Only slight issue was no-one was around when we wanted to check out in the morning and pay- went looking for someone but still couldn't find anyone until a cleaner saw me and got a member of staff. Not a dislike but a heads-up - because the building's so old, the stairs would not be suitable for anyone with disability. Bedroom No1 where my mother & father in law slept was a superior room with a large size bed. Unfortunately the mattresses consisted of 2 single mattresses butted together but also the springs had worn and were poking up which meant the occupants did not get a good nights sleep which is a shame as we had a long journey down to that location followed by a long return journey back the next day. We have stayed before at the Angel and all was fine on previous visit and would visit again but the mattresses require changing for future use (for any occupant). Therefore the cost of that room did not merit the price paid especially as we had upgraded our rooms to superior rooms prior to visiting (extra cost £10 per room) as my Father Inn law was recovering from a recent illness. On check out I mentioned to staff about the mattresses in room 1 and told them that they required changing. If you could please follow this up I would be most grateful and it would be nice if the hotel would maybe offer some form of a gesture of goodwill for any future visit. Thank you. Noise from next room's shower was rather intrusive. Shower was small. The staff were excellent, and there was a very good staff to customer ration. All the food we ate was very good. Ideal location for exploring the area that I holidayed as a boy. Spacious room and large comfortable bed. Would stay here again if we returned to area. Lovely cooked to order breakfast. Separate shampoo and conditioner and we forgot toothpaste so that would’ve been a great touch. Bed was massive and very comfy, the staff were very friendly. The shower was great. Nothing to dislike - however, room was a little warm. Opening a window and quick radiator adjustment - all sorted. Comfortable room. Very helpful and friendly staff. Excellent food. Wonderful breakfast in the 'well' room.